There were a few reasons why we chose Tahiti. First, we knew we had to go somewhere close to home due to our work schedules. Living in San Diego meant that anything in Europe (including Kim's dream vacation - a Mediterranean Cruise) was out of the question. We decided we wanted something beachy and tropical, so we considered all the typical honeymoon spots in the Atlantic for a while. Unfortunately for Kim, her dad is a HUGE worry-wart, so going to any of those islands during hurricane season would have not boded well for family relations. With that said, we started exploring the idea of going to islands in the Pacific. Since we wanted to go someplace foreign, Hawaii was out. One day while surfing the internet Kim came across French Polynesia. 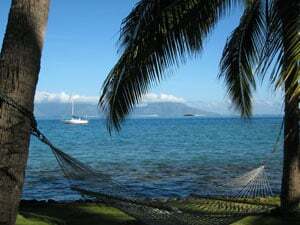 Once she found that Tahiti was only a seven hour direct flight from LAX we were totally sold! 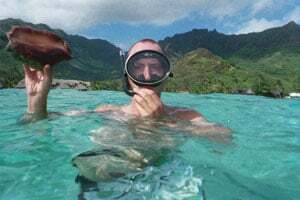 After extensive research and consulting with travel agencies, we decided we would spend a couple nights on the island of Tahiti and a few more nights on the island of Moorea. Bora Bora would have been great to add to our island hopping, but was just too pricy. At the suggestion of our travel agent, we ended up making reservations at the Intercontinental Tahiti Resort on Tahiti and the Moorea Pearl Resort & Spa on Moorea. Both hotels were very nice. We also decided against the over water bungalows not only because we couldn't afford them but because we knew we wouldn't be spending all our time in the room (we're extremely active people!). We figured spending our money on excursions and nice restaurants was better than staying in an extravagant room. Not to mention the "regular" rooms were perfectly wonderful! Our time on both islands consisted of a similar schedule every day: sleep in, have breakfast, lounge by the pool, have lunch, go on an excursion, have dinner, go to bed. The only thing that changed daily was the excursion. 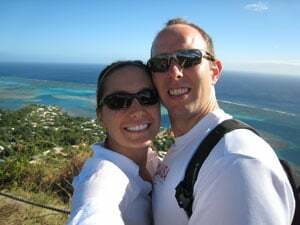 We did a number of amazing things... a sunset cruise, an inter-island tour of Tahiti, exploring the capital city of Papeete, an inter-island tour of Moorea, a couples massage, a jet ski tour and a dolphin cruise. Our two favorite experiences were the sunset cruise and jet ski tour. The sunset cruise occurred our second night in Tahiti and was absolutely amazing. Words can't describe how beautiful, romantic and special it was. Because we were the only people to book the cruise that afternoon, we essentially had a private tour! Our captain took us along the northwest coast of Tahiti and stopped at a surf spot to watch the locals. Later he took us to a sandbar where we could wade in the water while sipping champagne and watching the sun set over Moorea. It was truly magical. Our jet ski tour in Moorea was by far the most fun part of our trip. 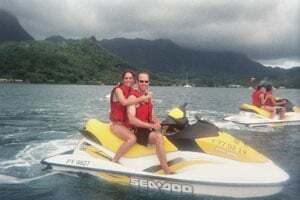 We toured around Moorea for two hours, enjoying the beautiful scenery and playing in the waves on the jet skis. Kim was very impressed with Kevin's expertise in jet ski driving! Our tour guide then took us to a sandbar that was a gathering place for manta rays and black tip sharks. It was amazing how friendly they were! What an experience to feed and kiss a manta ray in the clear blue waters of French Polynesia. Amazing! All told, the honeymoon probably cost us about $6,000. Our Traveler's Joy registry sold out at $5,000 so we only spent about $1,000 of our own money. We are so thankful to our friends and family who supported our dream of having our honeymoon be the trip of a lifetime. We would have never been able to afford such an extravagant vacation if it weren't for them. We highly recommend French Polynesia to all honeymooners. It is the epitome of relaxation, seclusion and beauty. We were told that the amount of people that travel to Hawaii in one day is the same amount of people that travel to Tahiti in one year. What else can be said? It's quiet, the people are very nice and the weather simply can't be beat. We will never forget our trip to French Polynesia and plan to go back for our anniversary sometime in the future.